Larry Davis probably won’t finish the third-annual Miles For Meso Race Sunday in Boca Raton, Florida, but he will be at the starting line bright and early with everyone else. His latest hospital stay will not keep him away. The event means too much to him now. Davis, who was diagnosed with mesothelioma in 2006, continues to battle the same cancer that killed his father many years before, inspiring others now with his determination to work toward a cure. 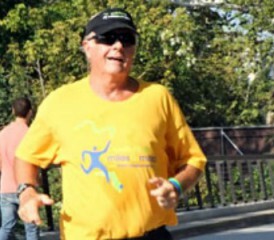 Davis, 65, helped start the Florida event in 2010, one of several Miles for Meso fund raisers around the country now that benefit the Mesothelioma Applied Research Foundation (MARF). With a good turnout this weekend, Davis hopes the three-year total will top the $100,000 mark. The event this year will include a Mesothelioma Symposium Saturday at the Hilton Hotel in Deerfield Beach (3-7 p.m) with Raja Flores, M.D., from the Mt. Sianai Medical Center in New York. On Sunday along A1A in Boca Raton, there will be both an 8 K Race, and a two-mile Tribute Walk, in which Davis will start. In the previous two years, Davis ran in the timed race. And just eight months ago, he ran a Father’s Day Triathlon with his daughter Courtney, only a few days before one of his many surgeries. Since his original diagnosis, Davis has followed an unconventional path, shunning much of the chemotherapy and radiation treatments that many patients choose to endure. His focus, and the research money he continues to raise, has been on alternative treatments. He has been a strong advocate pushing for a complete ban of asbestos, the cause of mesothelioma, which currently has no cure. He still is irked at the lack of government leadership in pushing for that ban in the United States, which already exists in more than 50 other countries around the world. Davis, who lives in South Florida where he still owns an eyewear and sunglass business, is scheduled to be in California next month to be honored at the Asbestos Disease Awareness Organization (ADAO) Conference for his fund raising efforts. The Miles for Meso Race this weekend is the first of four similar events in the next three months that will be used by MARF as it moves through Pennsylvania, New York and Connecticut.